The new academic year is upon us and with that comes the need to create a space for intellectual stimulation and productivity. Even if you don’t have a room dedicated to work and study, you can still create a comfortable and inspiring nook where you can assist your kids with homework or do some work yourself. Here are our 8 expert tips for creating a study corner that will help you do just that. A comfortable chair and sufficient desk space are the only things that you really need to make a study corner work for you. It doesn’t have to be big – depending on your exact needs, even a simple trestle table will do. Natural day light is not only less strenuous on your eyes than artificial light, it is also great for your mood. Ensure that the desk is placed in such a way that you don’t get any glare on your computer screen. Light from the side or directly from behind the computer screen when the desk is placed against a window works best. Even though day light is first prize, you also have to ensure that there is sufficient task lighting for working outside of daylight hours. A desk lamp can also be a beautiful statement piece on a desk, so choose something that is both functional and aesthetic. Use a cool white to daylight bulb to shed optimum light on the work surface. Just because it’s meant to be a productive space doesn’t mean that you can’t have fun with it! We are inspired by the things we love, so add a pinboard or gallery wall to your study corner. If it will be too distracting on the wall facing the desk, add it to an adjacent wall. An organized desk area is said to improve productivity, and for that, ample storage is needed. 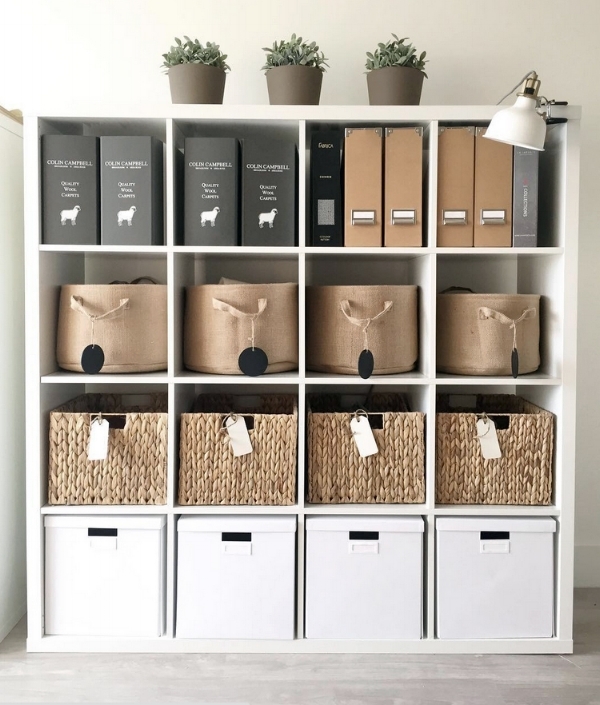 A large storage unit with space for baskets, files, books, and more is ideal. Don’t have the floor space to add freestanding or built-in shelving units? Utilize the area above your desk and install floating shelves or cubbies. These are great for books and files or to display artwork on. Plants uplift the spirit and help with air purification, which is just what you need when you’re working late at night! Add some greenery to your desk area with lush houseplants or fresh flowers. Match the pots to the rest of the decor in the room and add your personal touch in the process. #8: If You Can’t Hide It, Flaunt It! In many homes, the study is a small little nook that forms part of the living room, kitchen or a bedroom. Integrate this small, practical space with the rest of your decor by matching the color scheme and adding complimentary accessories. You can even match the upholstery to the rest of the furniture in the living room. This will enable you to use the desk chair as an extra chair for guests.